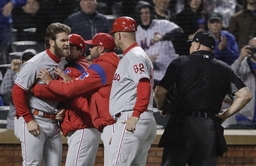 NEW YORK (AP) Major League Baseball is reviewing Bryce Harper's rant at an umpire, trying to determine whether the Philadelphia Phillies star should be disciplined. There was no decision Tuesday, a day after Harper went wild during a game against the New York Mets at Citi Field. Harper was ejected for the 12th time in his eight-season career while he barked from the dugout four batters after being called out on strikes by Mark Carlson.